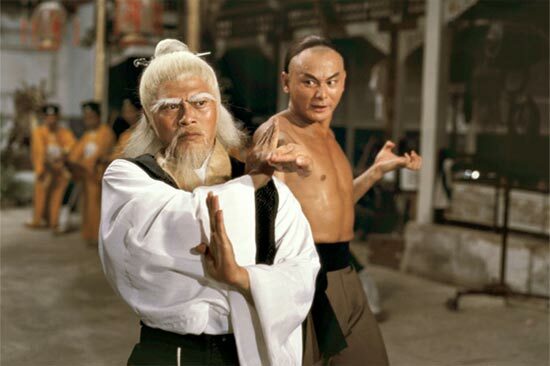 Lo Lieh and Gordon Liu in Clan of the White Lotus. The Skinny: This enjoyable semi-sequel/remake of Executioners from Shaolin finds Gordon Liu's character locked in mortal combat with the Chief of the White Lotus Clan. A repetitive, but otherwise charming kung fu extravaganza directed by longtime actor Lo Lieh. Clan of the White Lotus serves as a loose sequel to 1977's Executioners from Shaolin, but the film shares just enough plot elements and characters with its predecessor to be considered somewhat of a remake as well. The film begins with a credit sequence that feels like the rousing climax to a previous filmbut the footage shown is brand new. In any case, the opening coda features two Shaolin warriors fighting against the vicious "White Eyebrow Priest" Pai Mei in some burnt out ruins. By combining their respective tiger and crane styles, the two heroes defeat the famous villain in an acrobatic display of martial arts prowess. The movie then flashes forward a few years to a time when the Emperor lifts the ban on the Shaolin temple, allowing all Shaolin brothers to be released from prison. Hu Ah-Piao, one of the two heroes who beat Pai Mei, is scheduled for release, much to the delight of his pregnant wife Mei-Hsiao (Kara Hui Ying-Hung), his best friend in arms (who for some reason isn't in jail) Hung Wei-Ting (Gordon Liu Chia-Hui), and his lovely sister Ching-Ching (Yeung Jing-Jing). Of course, those loyal to Pai Mei are angered by the emperor's show of mercy, but none are more outraged than the evil White Lotus (Lo Lieh), chieftain of the White Lotus Clan and the identical twin CLASSMATE of Pai Mei. Thirsting for bloody retribution, White Lotus leads an all-out attack on our heroes, which leaves both Ah-Piao and Ching-Ching dead. Barely making it out with their lives, Mei-Hsiao and Wei-Ting escape to another village where they gain employment at a paper dummy shop. Seeking to avenge the death of both his sworn brother and his fiancée (he and Ching-Ching were hoping to get married), Wei-Ting tries to combine Tiger and Crane boxing into one style, practicing every evening after work. Not used to practicing alone, Wei-Ting tries to recruit Ah Piao's pale-faced brother Ah-Chang to help him train, a move that results in some fine comedic moments. The obvious contrast between the skilled Wei-Ting and his weak, uncoordinated, and comically unwilling helper makes for some hilarious sight gags. Wei-Ting loses his bout with White Lotus on the first try, so he trains for a few more years, but sadly he ends up failing yet again. After learning that his technique is too forceful to strike the ethereal White Lotus Chief, Wei-Ting looks to Mei-Hsiao to teach him a softer, more feminine style of kung fu. She agrees and makes him do "women's work" to begin his trainingcaring for the baby, sewing, etc. Eventually Wei-Ting learns the slinky, graceful techniques of his sworn sister and sets off to face White Lotus. He's gonna win, right? Wrong. He LOSES. AGAIN. I think I'm beginning to see a pattern here. This time around, however, Wei-Ting almost loses his life in the process, nearly succumbing to White Lotus's 100-Pace Punch, a deadly maneuver which kills the victim one hundred steps after the blow is delivered. Thanks to some acupuncture from an unlikely ally, Wei-Ting is back in action. Eagerly, he learns the secrets of acupressure points and incorporates this new knowledge into his own eclectic mix of Tiger, Crane, and Women's kung fu to create a whole new style of fighting: embroidery kung fu! With acupuncture needles in hand, Wei-Ting heads off for the final showdown with White Lotus. But will he win? With the seemingly endless training sequences and failed sparring matches with the main villain, Clan of the White Lotus is an awfully repetitive movie. However, it's not an awful movie. The film boasts some strong performances all around, which elevate the movie beyond its ho-hum revenge plot. Gordon Liu makes this film. His screen presence is so incredibly strong and so darn likable that one tends to forgive the sheer repetitiveness of the plot. A big surprise in the film is Kara Hui Ying-Hung's performance. She really shines in the role of Mei-Hsiao, imbuing it with more humanity and depth than was probably on the written page (assuming there WAS a script, of course!). In the previous film Executioners from Shaolin, the female lead was little more than an outside observer giving moral support to the hero. Here the woman has a more proactive role, which benefits the film considerably. It also doesn't hurt that Kara Hui is an elegant, dexterous performer, who demonstrates her "feminine kung fu" with an obvious grace and confidence, which Gordon Liu plays off of perfectly. Notes:  Contrary to popular thought (numerous sources make this mistake), the villain of the film is NOT Pai Mei. Yes, he looks the same, has the same powers, lives in the same home, and is portrayed by the same actor, but the film makes it clear: Pai Mei is killed during the opening credits.  Is it a sequel? Is it a remake? In Executioners from Shaolin, the son of Hung Hze-Kwan combined the tiger and crane techniques of his parents to defeat Pai Mei. In Clan of the White Lotus, that event is rewritten so that Wei-Ting and Ah Piao use their tiger and crane styles together to kill Pai Mei. Interestingly enough, the character "Governor Kao Ting-Chun" appears in both films, but is played by different actor each time.